History was made in the port of Walvis Bay this week when four luxury cruise liners came alongside and moored at the docks at the same time. 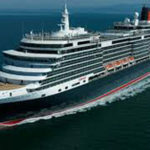 The MSC Musica, the Nautica and the Queen Elizabeth has already arrived in the port and more than 7 000 tourists are expected to disembark from the vessels to take in the scenery in and around the two main coastal towns. The simultaneous arrival of the three vessels in the Walvis Bay harbour on Wednesday was preceded by the arrival of another passenger liner, the AIDAura on Tuesday. “‘The Port of Walvis Bay looks forward to hosting the cruise liners. We have geared up our security and transport resources during this time to ensure a smooth flow of movement for 7 000 passengers moving in and out of the port. The town of Walvis Bay has an opportunity to show case the beauty of our natural assets and hospitality. The town will be abuzz for a few days as the local tourism and other commercial sectors will benefit from our international visitors.” Namport acting Chief Executive Officer, Elias Mwenyo, said in a statement.